China's Shenzhou 9 spacecraft parachuted to a jolting rocket-assisted landing in Inner Mongolia on Friday, safely returning three astronauts to Earth after nearly 13 days in orbit. 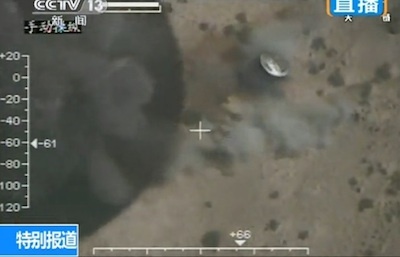 Landing occurred at around 0202 GMT (10:02 p.m. EDT; 10:04 a.m. Beijing time) in Siziwang Banner, a county in northern China's Inner Mongolia autonomous region. 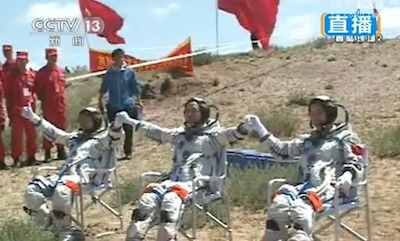 Commander Jing Haipeng and crewmates Liu Wang and Liu Yang, China's first female space flier, were helped from the capsule about one hour later. The astronauts were placed in chairs and carried nearby for a photo opportunity. All three crew members appeared healthy and good spirits, flashing smiles and waving to the recovery team. "It feels really good to feel the ground and to be back home," Liu Wang said to a reporter from Chinese state television. The astronauts activated China's Tiangong 1 space lab module, living and working aboard the bus-sized craft for about 10 days. Tiangong 1 is a testbed for a future Chinese space station. Shenzhou 9 pilot Liu Wang flew the capsule to China's first manual docking in space, proving future astronauts could control the Shenzhou spacecraft by hand. China's earlier docking procedures were conducted automatically. Shenzhou 9 and Tiangong 1 formed a complex stretching more than 60 feet long. "It's like a home on Tiangong 1, and I feel very happy and very proud of my country," Liu Yang said after landing. The astronauts were scheduled to fly to Beijing on Friday for debriefings, medical exams, and reunions with family. Shenzhou 9 blasted off June 16 on a Long March 2F rocket, entering orbit and pursuing the Tiangong space lab more than 200 miles above Earth. The two vehicles linked up automatically June 18, followed on June 24 by the manual docking. The manual docking maneuver was crucial for China's future space aspirations, which include the launch of a larger man-tended Tiangong space lab in a few years. But first, China plans another crewed flight to Tiangong 1 some time next year. Engineers will operate Tiangong 1 from the ground until the next mission arrives. China plans to move the module to a higher orbit, and the state-run Xinhua news agency reported its mission could be extended. "This manned docking mission of Tiangong 1 and Shenzhou 9 marks a milestone and a major breakthrough for China to master space docking technologies, and also it marks a decisive step forward on China's second step in its space strategy," said Chinese Premier Wen Jiabao, who read a letter to mission controllers in Beijing from China's political leadership. Shenzhou 9 was China's fourth human spaceflight since it started flights in 2003. China plans to launch a Mir-class space station around 2020 to potentially house permanent inhabitants. China is also developing a heavy-lift Long March rocket to haul massive modules into orbit, and engineers are researching human voyages to the moon.